The grounds were re-landscaped in the fall of 2018 and we need to ensure the new grass gets a fair start before being trampled. The New Hampshire Astronomical Society holds at least one event every month at YFOS. These are opportunities for fellow astronomers and guests to view together and exchange thoughts while at the eyepiece. It is also a time when new members or persons just starting out with telescopes can get advice on the instruments' operation. It should be noted that the site is also available to members at any time for their own solitary observing needs. Background work on this site started in earnest in 1996. This involved identifying the property, and doing the sub-division, insurance and other legal items. Physical activities and construction started in the spring of 1997 with completion of the warming hut at the end of 1998. The (very) low cost lease of the land is made possible by the generosity of by Jim Young, with the help of Andy Jaffe. Most of the credit for the planning and momentum associated with developing the site goes to Mike Stebbins. These people were absolutely critical in making this happen. Of course it takes many, many people to realize such a project and there were others involved in getting the donated building materials, doing the construction, organizing, cooking, and so on. The building itself is the former scale house from the Manchester Landfill - its acquisition was negotiated by Jeff Carter. The list of consistent contributors numbers in the twenties. These people gave hundreds of hours to the project and really were responsible for creating such a wonderful place to practice our hobby. After much planning and design work by Joe Derek, Joel Harris, Larry Lopez, Chase McNiss, and Mike Stebbins, ground breaking on the roll-off roof observatory finally happened in the Fall of 1999. The footings were poured just in time before the Winter frost set in. Work resumed in the Spring of 2000. A huge amount of work was done that summer by Joe Derek, John McLean, and most of the rest of the club! 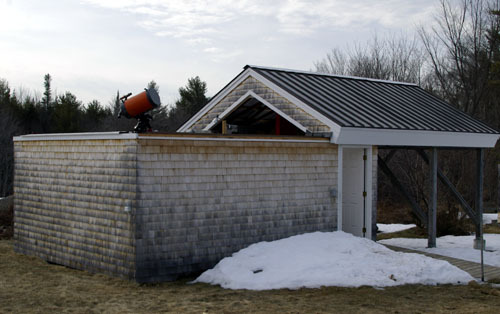 The observatory was 80% complete and nominally operational with a 16" Dobsonian scope by Winter. Larry Lopez cast the concrete pier base and contributed his C-14 optical tube assembly. Joel Harris, Don Ware, and Larry later designed and completed the permanent pier for the Losmandy Titan mount. The site is located in central New Hampshire, about 40 minutes from the intersection of Interstates 89 and 93 in Concord. This makes it over 20 air miles from the lights of Manchester, giving us reasonably dark skies. Because it is a private and controlled-access site we can't tell you exactly where it is but all club members know and members are encouraged to bring guests. The warming hut has nearly all the comforts of home. It is insulated, has electricity, a small propane heater, a radio, computer, coffee pot and even a small microwave oven! It is equipped with both red and white lighting and the floor is a wonderful non-slip tile that was professionally installed. There is a chemical toilet that is separate from the warming hut but attached to the building. Storage for the club's book and magazine collection, chairs and tables round out the versatility of the hut.